Bittersweet news for fans of HBO’s The Newsroom as the network has confirmed the Aaron Sorkin drama has been renewed for a third season, but it will be the show’s last. The Newsroom has met with mixed reviews from critics, though Jeff Daniels did pick up a surprise Emmy for his portrayal of the show’s anchor. Anyone who’s followed the blog knows that I’m a huge fan of Sorkin’s work. The first season of the show, which is the only I’ve seen so far, was slow to build on the sterling pilot (which contains possibly the greatest rant in television history) but was brilliant in spots and had hit its stride by season’s end. The positive point in this is that Sorkin will probably be writing another movie soon. Full press release from HBO after the break:The Emmy-winning HBO drama series “The Newsroom” will begin production on its third and final season this spring, with a premiere slated for fall, it was announced today by Michael Lombardo, president, HBO Programming. 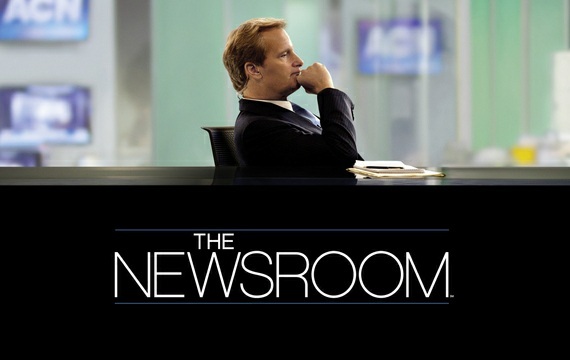 Created by showrunner Aaron Sorkin (Oscar-winner for writing “The Social Network,” executive producer and creator of the multiple Emmy winner “The West Wing”), “The Newsroom” follows the members of a cable news team on their quixotic mission to do the news well in the face of a fickle audience, corporate mandates and tangled personal relationships. Sorkin, Scott Rudin and Alan Poul return as executive producers, with Paul Lieberstein (“The Office”) joining the show as an executive producer. Returning cast regulars include Jeff Daniels (who received an Emmy in the category of Outstanding Lead Actor in a Drama Series for the show last September), Emily Mortimer, Sam Waterston, John Gallagher, Jr., Alison Pill, Thomas Sadoski, Dev Patel and Olivia Munn.